(1) The bank account numbers of the applicant. (2) the Social Security Number of the applicant. Add to that the request for a photocopy of the applicant's driver's license, which was also requested, and you have the minimum information necessary for an identity thief to adopt this individual's identity, craft a reasonable facsimile of the applicant's driver's license, go to a faraway branch of the applicant's bank, and clean out the accounts. Last year, someone showed up at a branch of my bank 30 miles away from my residence, with a bogus driver's license ( he was African-American, and I am not) and, making a dummy deposit of bad checques, obtained $700 out of my account. The bank teller failed to check my signature, and paid out the money. Of course, a financial institution, under the law, is deemed to know the signatures of its own depositors, due to the signature card they hold, so the money was refunded by the bank. Back to our story: I assume that Renters Reference has attorneys on staff. Perhaps they would like to pay the amount of any judgments obtained by individuals who are victimised by identity thieves who gain easy access to their files. Gentlemen, please change those forms forthwith. "Given the serious and complex nature of the issues presented by the submissions for this sentencing, and the fact that I will be presiding over as bench trial next week, Bout's request is granted in part. Bout's sentencing is adjourned to April 5, 2012, at 4:30 PM. Bout's submissions are due March 27, 2012. Any submissions by the government are due March 30, 2012. No further extensions will be granted for ANY REASON. So ordered, Shira A. Scheindlin, USDJ 3/21/2012." Albert Dayan, Bout's attorney, then filed a letter, on 23 March, that appears to be a sentencing memorandum, but he has made an extraordinary plea, in a filing that charges the government with selective prosecution, malice and vindictive prosecution: "We ask the Court to decline to sentence Viktor Bout and thereby become an unwilling party to his wrongful prosecution ...." (at 1) The entirety of the prosecution of Victor Bout, from its inception through trial, was the product of outrageous, inexcusable government conduct. He is innocent ." (at 14). We shall continue to keep you updated on this important case. * United States vs. Bout, Case No. : 08-cr-000354 -SAS (SD NY). The US Department of Justice has filed a brief in opposition to the Petition of the Peoples' Mujahedin of Iran, (a/k/a MEK) to seek a Writ of Mandamus, ordering the Secretary of State to decide on the revocation of the Foreign Terrorist Organisation designation that has existed against the MEK since 1997, or alternatively, to order the Secretary to revoke the FTO sanctions. (1) Statutorily required consultation between the Secretary and the Attorney General. (2) A close analysis of highly classified information. (3) Expert judgment concerning the continuing capabilities and intentions of a currently designated foreign terrorist organisation. (4) Extremely sensitive national security judgments. (5) Difficult decisions concerning the best way to avoid possibly serious human rights designations. (A) The Circuit Court had previously upheld the FTO designation by the Department of State. (B) State had earlier denied MEK requests, finding that there was not a sufficient change in the relevant circumstances to revoke the terrorist designation. (C) State is in the midst of the lengthy process of reviewing fresh, classified relevant information. (D) A Writ of Mandamus does not properly lie in this case, and is inappropriate. It was filed because, in the opinion of the MEK, the Secretary's review, an ongoing agency process, is taking too long to complete. Equitable relief does not lie, even where an agency has exceeded a statutory deadline for review. (E) The pending relocation of MEK members within Iraq is an additional key factor regarding any decision regarding the FTO status. (F) Classified information about the MEK needs to be declassified, so that the oprganisation can respond to it. When the MEK, and those Americans who have previously acted as Amicus Curiae (Friends of the Court), respond, we shall update our readers on this case. *In re: People's Mojahedin Organization of Iran, case No. : 12-1118 (DC CIR). (2) Bank accounts of co-conspirators, known as "Money Mules" in the case, who were foreign students lawfully in the US on visas, and foreign nationals present in America on no-immigrant visas. (3) The organisation provided bogus foreign passports to the Money Mules, which allowed them to open accounts, which received the wire transferred stolen money. (4) The Money Mules drew out the funds in cash, and thereafter they, and others, bulk cash smuggled the funds out of the United States. The Take Away: How on earth did these foreign nationals succeed in opening new accounts with only a (bogus) passport ? Weren't these identity documents check with Passport-Check, or equivalent, to ensure that they were not bogus ? Why weren't official secondary forms of ID required ? Weren't their Internet footprints checked, to see that the names were of individuals with web history of at least several years ? A name without a valid an extensive Internet history could be bogus, and probably is. This sounds to me like compliance malpractise. Remember, always require a number of secondary identification documents to back up a passport, and ensure that this individual has an Internet history going back several years. *United States vs. Nicolay Garifulin et al, Case No. : 10-CR-000928-VM(SD NY). Longtime readers of my work will recall when I exposed the billionaire money launderer for Venezuelan President Chavez' family, Ricardo Fernandez Barrueco, whose arrest and current imprisonment in Venezuela was reportedly at the personal request of Fidel Castro. Now, someone claiming to be yours truly has written to blogger and critic of the Chavez regime, Alek Boyd, trying to intimidate him into deleting my old articles exposing Fernandez from his website. Why bother, he will not be released from prison, nor tried, so long as Chavez remains in power. Fernandez knows all the secrets about Swiss bank accounts. How can anyone take an impersonator seriously, when his letters contain grammatical errors, misspellings and other clear evidence that it is obviously not yours truly, who does know how to write and spell. Who would believe such a poor work product ? Thugs shouldn't try to masquerade as literati, please. I invite you to visit Alek's blog, and see what passes for threats these days, courtesy someone who failed to pay attention in class. If you are a banker whose customer is considering doing business overseas with an unknown company, a lawyer who must vet a counter-party for a client, or a corporation who is examining a possible business transaction with a new entity, you may find that you must, for reasons of time, lack of experienced staff, location of foreign target, or simply inability to properly perform the task yourself, you may have as need for an Enhanced Due Diligence investigation, to be performed yesterday, if not sooner. Readers of this column, from time to time, come to me with this problem, because, as consumers of this type of service, they are looking for affordable, yet effective outsourcing of EDD, delivered forthwith. Over the last 20 years, I have seen that, if you are not careful, you end up paying clearly excessive fees to large firms whose staff often miss important information, because they assign your job to staff with insufficiently rounded experience to see the big picture. Wondering why the Iranian man in the street is not calling for an end to his country's illegal WMD and ballistic missile programmes, so that he can eat ? It's because the United States sanctions programme specifically exempts most food items. Add to that medicines and medical devices, cigarettes chewing gum, sporting goods, popcorn, cupcake sprinkles, hot sauce, and a host of other things, and you have your answer. If we don't stop everything, it could fail miserably, just like it has with Cuba since the 1963. Now add to this, the indirect export of prohibited goods to adjacent countries (e.g. UAE, Turkey, Jordan, Iraq, and on and on) that America fails to carefully monitor to end users. They are simply transshipped on the dhow across the Gulf, or on transport to the border of Iran, and you get sanctions failure, squared. If you are seeking economic sanctions as a means to force compliance with United Nations sanctions upon the manufacture of Weapons of mass destruction, kindly remember that economic warfare must be total and universal to succeed. What the United States is doing now is fooling itself. So long an our typical Iranian can purchase American-manufactured juice at his corner market, sanctions will fail. RAISE COUNTRY RISK FOR VATICAN CITY ? Reports that JP Morgan Chase has given notice to the Vatican bank*, that it intends to close its account at the international investment bank, on or about 30 March, may mean that the recent designation of the Holy See as a "Jurisdiction of Concern," in the annual International Narcotics Control Strategy Report (INCSR) is getting attention amongst compliance officers at international banks. (1) The account, which was reportedly opened in 2009, moved $1.5bn into other accounts in the EU, and no satisfactory reason for this traffic was given to routine enquiries, according to Italian sources. (2) The account was "swept" daily, meaning that that it was cleaned out before the close of business each day. This procedure is inconsistent with the use of an account to conduct legitimate business, but is commonly employed when seeking to hide illicit cash obtained by criminal means. Was it the proceeds of corruption ? Bear in mind the seizure, by Italian authorities, of $33m in 2010; was this incident merely this the tip of the iceberg ? These questions deserve answers. Compliance officers at international bank entrusted with the assessment of country risk should examine the facts, make diligence enquries, and adjust country risk for the Vatican accordingly. * Formally known as Istituto per le Opere di Religione, or The Institute for Works of Religion, a/k/a IOR. Readers who share my interest in bulk cash smuggling cases, are invited to review these three new Federal appellate decisions. The citations are to slip opinions. Note that some opinions are not published in the Federal Reporter. (1) United States vs. Francisco Javier Castaneda-Castillo, Case No. : 11-50186 (5th Cir. 2012). (3) United States vs. Samir Ibesevic, case No. ; 11-4151 (9th Cur. 2012). China has seized two Vietnamese fishing vessels, and detained 21 crew members, all Vietnamese nationals, in the area of the disputed Paracel Islands. A fine equivalent to $11,000 has been demanded by the Chinese Government for the release of the fishermen. The fisherman have been accused of "Illegal Poaching," for working in what the Chinese view as sovereign territory, notwithstanding conflicting claims of other countries. The Paracels, which were occupied by the now-defunct Republic of Vietnam (South Vietnam) until China took military action against the islands in 1974, have been considered by China to be within its exclusive area of influence ever since, though this is in dispute. This incident is only the latest in a number of actions taken by China, regarding its stated official position that literally the entire South China Sea is within its territorial waters, though it is also a major international waterway to the Far East. Under the circumstances, it would be prudent to consider raising country risk on Vietnam, as well as the other countries whose territories border the South China Sea, should China seek, through military means to establish exclusive and sole control of the Paracel and Spratley Islands. The Chinese claim to the entire maritime region was established by the Republic of China(now relegated to only Taiwan) in 1947. The attorney for imprisoned former Panamanian dictator, General Manuel Noriega, has publicly stated that Noriega has a brain tumor. Said to be benign recently by a number of physicians who were seeking less strict conditions for Noriega's imprisonment, the general also suffers from a heart condition, and he recently was hospitalised due to influenza. Noriega is currently serving a sentence for murder and corruption; some sources state that his Panamanian sentence is 20 years, whilst others claim he is serving a sixty-year sentence. French Court says Noriega can be Extradited to Panama, 24 November, 2011. Noriega's Extradition to Panama Expected, 2 December, 2011. Noriega en route Panamanian Prison, 11 December, 2011. ARE NATIONAL EXEMPTIONS FROM IRANIAN PETRO-SANCTIONS AN INVITATION TO WMD EVASION ? Hillary Clinton, the American Secretary of State, has announced* that eleven Western Allies will be exempt from the strict sanctions against the purchase of oil and gas from Iran, because they have significantly reduced their consumption of Iranian oil. The question is: will innovative financial advisors be able to utilise this exemption to sneak through purchases of goods prohibited as facilitating the Weapons of Mass Destruction and Ballistic Missile programmes ? if I am a money launderer/financial advisor working for the Islamic Republic of Iran, my brain will instantly consider whether I can possibly ship prohibited dual-use goods to Iran, through these ten exempt countries, concealed in returning containers, tankers and shipping. I may choose to pay the third parties who sell me those banned goods in cash or gold, and totally evade the sanctions of the global financial system. Perhaps compliance officers in the countries listed above, whose financial institutions number as clients their countries' energy companies, might want to elevate their scrutiny of their clients' accounts, for some WMD suppliers may wish to be compensated, indirectly, through wire transfers. Anytime there exists a possibility of an opening in the sanctions regime, money launderers and their clients will attempt to drive a truck through it; Watch for it. WHY HASN'T THE US SEIZED MEK FUNDS ? What's wrong with this Picture ? Why haven't America's law enforcement agencies and regulators seized, and blocked, more than an extremely small amount of funds belonging to the People's Mujahedin of Iran, also known as the MEK, PMOI and MKO ? The organisation has been around since before the revolution against the Shah. Given the prominent Americans, many of whom are former senior government and military officials who served at the ministerial or general officer level, is there a political reason why we have not aggressively gone after the MEKs funds in the United States during the past thirty-five years ? The MEK remains a designated Foreign Terrorist Organisation (FTO), notwithstanding its campaign** to have those sanctions deleted by the Department of State. It is known to have targeted wealthy Iranian expats living in the US in its fundraising; so why hasn't this money ben seized when it was deposited in American financial institutions ? I have a feeling that there's more here than meets the eye. Frankly, I do not but this "the enemy of my enemy is my friend" business, because the MEK, which appears to have its own Cult of Personality amongst the leadership, has: (1) admittedly a poor human rights record, (2) little or no support within Iran, due its taking Iraq's side in the Iran-Iraq war, and (4) has assassinations of both Americans and Iranians in its past. Perhaps someone in the US Government might want to weight in here; where's the MEK money raised in the US, and why have we not seized it ? **MEK asks Appeals Court to compel US to revoke Terrorist Designation, 1 March, 2012. MEK to be Resettled outside of Iraq, 26 December, 2011. Investigation of MEK Supporters Reported, 13 March, 2012. MEK sends Open Letter requesting Delisting as Foreign Terrorist Organisation, 11 October, 2011. Businesses in the Republic of Turkey, with government approval, continue to ignore EU and US sanctions against Iran, due to its ongoing prohibited WMD and ballistic missile programmes. Turkey has adopted the lesser United Nations sanctions, and continues to trade with Iran, including in oil & gas. With the almost universal monetary barriers now in place, including the expulsion of Iranian banks from the financial conduit performed by the SWIFT network, alternative methods of payment, including bulk cash, and precious metals and jewels are reportedly being employed by Iranian purchasers dealing with Turkish suppliers. Under the circumstances, with the decline of the use of the United Arab Emirates (UAE) as a third-party agent to evade global sanctions, Turkey has emerged as one of the jurisdictions du jour, and for that reason, you are advised to review the facts, and, consider the decision to raise country risk on Turkey at this time. You do not want to be "named and shamed" on the US Treasury OFAC website on the monthly Fines and Penalties list. More importantly, you and your clients certainly do not to become involved in any criminal action. It is prudent to examine all large ongoing client transactions with Turkish clients, paying special attention to any goods or services that might possibly be deemed "Dual Purpose" by US law enforcement agencies. New client business with Turkish customers, that did not exist before 2012, is especially noteworthy; Watch yourself here. (1) Although the Tamil Tigers were soundly defeated on the battlefield, their overseas financial structure remains largely intact. It was created over a period of 25 years. Do not expect it to go quietly into the night. (2) It was this financial arm that "borrowed" and extorted money from wealthy Tamil expats worldwide for decades, and then used those funds to purchase weapons for the designated global terrorist organisation. (3) The Tamil diaspora is widespread, notably in Canada, and remains vulnerable to Tamil finance agents to this day. Do not believe for a minute that they have retired; their organisation, which some authorities claim has attained cult status, goes on. (4) I understand that human rights issues from the conflict exist, do not become complacent because celebrities are supporting an investigation. continue to be vigilant when it comes to unexplained funds movement coming from affluent Tamil bank clients or Tamil-owned businesses. Remember, it wasn't Al-Qaeda or Hamas that invented the modern suicide bomber; it was the Tamil Tigers who first employed them, as part of an asymmetrical terrorist operation. They still pose a serious threat; take heed. When you supplement your due diligence enquiry with a quick look at a search engine, never forget that there exists a cottage industry of Internet "rehabilitation" companies, whose sole aim is to prevent you from seeing that one negative news item about your prospective client that's on the web. What do they do, to accomplish this ? (1) See that favourable articles about the client, his business, or some other aspect of his life appear in articles that are posted to the www. (2) Make charitable donations on the client's behalf, especially where he is given online credit on the charity's website. Photo opportunities, where the client is pictured online, are particularly good. (3) have the client sponsor a sports club, especially a youth activity. Newspaper coverage always shows up. (4) Build a website extolling the client's participation in a non-governmental organisation that is responsible for good works in the community. If the client cannot join one, then they create one, and publicise it. it may be an inactive shell, or perform minimum tasks, but the websites always appear to exhibit a serious purpose; It could be bogus. (5) Expand the client's business website. Have him author something about the company's history, or its goals. (6) Have the client write (or ghost it) a scholarly or critical paper, and post it somewhere on the web. All of these activities, given their relevancy, will push the negative article about the client's arrest to the back of any search query. Lazy searchers typically only look at the first page of their search results. Are you one of those ? Therefore, always examine ALL of the entries you find in an Internet search of your target, lest you fall victim to a clever service that has effectively hidden that negative item at the end of your search results. Forget about the relevancy factor present in your search results; check them all out. If a bank client seeks to open an account for a company with bearer shares, you have a problem; how can you prevent him or her from immediately transferring ownership and control of the company, and therefore the accounts, by simply physically turning over the shares. Since the owner is not registered in company records, but merely owned by the bearer of same, a person not known to you, who may be totally unacceptable as a client, an OFAC-sanctioned individual, a career criminal, corrupt PEP, or worse, a terrorist financier, you have a potential problem. (1) Require the client to obtain for you an Opinion of Counsel, signed by a senior partner at an onshore major law firm in the (non-tax haven jurisdiction) country where he holds citizenship, attesting to his stock ownership, due to a due diligence inquiry. Lawyers have licenses to protect, and they will not give such a letter lightly, nor to anyone other than valued, legitimate clients. (2) Demand a sworn (notarised) affidavit from the client, confirming his ownership of the bearer shares, and recognising that he has an affirmative duty to notify you, by registered mail, or its local equivalent, should he sell, transfer, encumber, mortgage, or in any way divest himself of those shares. Money launderers and their clients do not like to sign affidavits that could be used to indict them at a later date; if the client will not give you (1) and (2), you do not want his or her business. Many legitimate clients will complain about this procedure, but it may be the only way to minimise your risk. Note: Do NOT buy into the client's statements that a Custodian will hold the shares of stock in the (offshore) jurisdiction of incorporation. Do you really want to file a civil suit in that country against the financial services professional, or attorney, after you find that they have evaded their responsibility, and found a way to transfer ownership to a criminal element ? Obviously not. Frankly, anyone who accepts a company with bearer shares assumes an uncomfortable level of risk, but if you must do it, mimimise risk through my solution, or choose an alternative, but it must be effective. A Georgia resident who had previously been found by CBP to possess large amounts of undeclared cash on arrival from the United Kingdom was sentenced to a term of one year nine months in Federal Prison, after his conviction in US District Court* after a jury trial, on Bulk Cash Smuggling charges. Stephen Willoughby had secreted $106,802, both in his luggage and on his person, on arrival at Hartsfield-Jackson International Airport. The defendant failed to declare that he was carrying more than $10,000 in cash, after being repeatedly questioned by Customs & Border Protection officers. He claimed that the cash was for the purchase of automobiles for export to Nigeria, and/or to support his unsuccessful restaurant business. There was testimony at trial that there was a "lookout" for the defendant, who had brought in $80,000 from the UK, previously, without declaring it. He was allowed retain that sum reportedly due to the failure of law enforcement to follow proper arrival procedures. His prior history included two additional arrivals with large amounts of currency declared on arrival, in 2007 and 2009. There's a pattern here. Does he fit the traditional bulk cash smuggler profile ? it is hard to say. He may be a successful criminal who is no longer involved in illicit activity, and has hidden his proceeds of crime offshore, repatriating it as needed. That's my best guess, based upon my experience. His attorney argued at trial that there was no testimony that the money was connected to any criminal activity, and that he was entitled to a Downward Departure in his sentencing computation, but the Court failed to grant his motion. The penalty imposed also included three years of Supervised Release, and one hundred hours of Community Service. Did the Court add this last item due to its finding that the defendant committed Perjury during his initial contact with law enforcement ? It did hold that he obstructed justice. The maximum penalty for Bulk Cash Smuggling is five years; should he have received a stiffer sentence ? You be the judge, but I believe that he is getting off easy. *United States vs. Willoughby, Case No. : 11-cr-00280-CAP-JFK (ND GA). A sentence in an article appearing today in mass media noted that wholesalers of counterfeit medicines had been in trouble with the law years earlier. When performing Due Diligence investigations of prospective high net worth clients, always remember to check their background in the criminal justice system. Career criminals often transition into industries with less risk of arrest than the one they are engaged in. For example, some online gambling operators have been found to be former pornographers, and of course narcotics traffickers have been moving into cigarette counterfeit distribution for many years. You must always ferret out these former unsavoury occupations, before you onboard the client. The client's fraudulent activity may not have risen to the level of a felony, but did result in a civil judgment; find it. (1) Public Access to Court Electronic Records, more commonly known by its acronym, PACER www.pacer.gov/ It is a subscription service, but allows access to Federal civil, criminal, appellate and bankruptcy files, past or present. (2) You local county court online service. It may only give you the court docket, civil & criminal, but often that will lead you to the actual court file at the courthouse. (3) The Public Records Library: recorded final judgments, and other instruments that reflect your client's background. (4) State Secretary of State online databases: they will identify the client's past and present companies, which you should search (1) through (3) above, for information. Commercial off-the-shelf databases of high-risk individuals often do not cover small fish. Therefore, check out these local KYC tools before accepting the client. If you share my interest in bulk cash smuggling cases, you should review the opinion in United States vs. Toro-Barboza*, an interesting Ninth Circuit Court of Appeals case. The detailed decision, affirming the trial court conviction of two individuals for bulk cash smuggling and failure to file reports on exporting monetary instruments, resulted in sentences of41 and 46 months. The individuals, whose vehicle was found to contain $500,087, asserted a number of defenses through their counsel, including lack of knowledge, and constitutional defenses, which you may find instructive should you become involved in one of these cases. Please note the decision, which can also be found on www.leagle.com/ , has the following 9th Cir. case numbers: 10-50487, and 10-50491. Jean Rene Duperval, the former Director of International Relations for Telecommunications D'Haiti, more commonly known as Haiti Telcom, the country's telephone monopoly, was convicted of 21 counts of money laundering, and money laundering conspiracy, in US District Court in Miami*. He received $500,000 in bribes from Miami telecom companies, for which he granted them contracts to service Haiti at extremely favourable rates, and laundered his criminal proceeds through two shell companies. The American companies booked the bribes as "consulting services," and Duperval showed the money as "commissions" and "payroll" in his shell companies. This far, eight other defendants have been convicted in this case, including an American businessman who received a 15 year sentence for FCPA violations, which is believed to be the longest sentence handed down in a Foreign Corrupt Practise Act case. Duperval could theoretically, if the maximum sentences in each count were handed down to be served consecutively, receive a maximum sentence of 420 years in Federal Prison. The case reaches all the way to the highest office in the hopelessly corrupt Republic of Haiti. The former head of the Central Bank of Haiti was assassinated recently in Port-au-Prince. His son, who is reportedly slated to testify in the Miami case, allegedly named former President Jean Bertrand Aristide as one of the recipients of bribes. The scandal does not stop there; rumours persist of unusually favourable arrangements in Haitian telecommunications contracts that financially enriched high-ranking members of the Democratic Party in the United States. Whether these sensitive allegations will formally surface in the Miami case is not known, but they do reportedly involve individuals from the period when former President Bill Clinton served in office. Readers not familiar with the country risk aspects of doing business in Haiti should understand that the level of institutionalised corruption there is higher than any other country in the Western Hemisphere, including Venezuela. Incurring any financial risk or exposure is to be avoided at all costs. The court system is dysfunctional, should you choose to assert contractual rights, or recover monetary damages, and I frankly felt in as much personal danger whilst working there, as I did as a soldier in Vietnam at the height of the war. Outside of private security, and the UN presence, the country is functionally lawless. You are well advised to avoid any financial entanglement that involves Haiti; take it from someone who has experience on the ground there. A final note: Haiti Telco is reportedly now owned a by a corporation controlled by the military from the Socialist Republic of Vietnam. *United States vs. Duperval, Case No. : 09-cr-21010 (SD FL). A number of media reports say that an investigation has been opened into whether prominent US citizens, who are acting as supporters or lobbyists for the MEK, a sanctioned Iranian organisation that opposes the current regime in Tehran, have violated sanctions regulations. Payment for these lobbying efforts appears to have come from Iranian-American advocacy groups and not from the MEK itself, raising the issue of whether there have been any sanctions violations. Is this investigation politically motivated ? There are those who oppose the removal of the MEK from sanctions lists, due to the claims that the group supported Saddam Hussein, has no grass-roots support within Iran, and that it was responsible for the assassination of a number of Americans during the period when the Shah was in power. Other Americans support the MEK, due to its stated opposition to the present regime in Iran, and possibly due to its history of attacks within Iran. The MEK is presently involved in seeking relief though the American court system*. *MEK asks Appeals Court to Compel US to Revoke Terrorist Designation, 1 March, 2012. Yachtsman Winston Robinson, of Bermuda, has been convicted of money laundering by the Serious Offences Court in St. Vincent. Robinson, who was transporting $1.7m in currency, bundled in 88 packages, has secreted the notes within the yacht Jo-Tobin. It was reported as the largest cash seizure in the history of the East Caribbean states. Mr. Robinson has been remanded into custody, and formal forfeiture of the seized funds is pending. We had previously reported on this case here*. *Bermudian on Trial for Bulk Cash, 25 January, 2012. The Federal Bureau of Investigation* has offered a reward of up to $1m for information leading to the release of retired FBI Agent Robert Levinson. Levinson, who was last seen on Kish Island, Iran, is reported to have been taken into custody by the Iranian Revolutionary Guard Corps (IRGC). He appeared last year in a video, but it is not known who is presently holding him, where, and for what purpose. Today, he has been held for exactly five years. 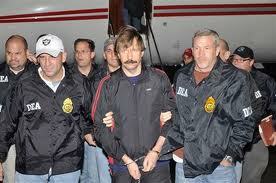 The Federal Judge assigned to Viktor Bout's case has ordered that his sentencing, which was scheduled for 12 March, be moved to 28 March. Reportedly the delay is due to a request by Bout's defence team, who are busy preparing their arguments. Bout could receive a sentence of between 25 years and life in Federal Prison, based upon the charges he was convicted under. Amongst the counts was one of providing material support to the FARC, a Specially Designated Global Terrorist Organisation [SDGT]. He attempted to supply anti-aircraft missiles that were to be used to kill American military and government officials. He was very recently moved from the equivalent of solitary confinement into the general population of the Metropolitan Correctional Centre, after the judge ruled that his confinement under such severe restrictive conditions was neither necessary nor constitutionally proper. On 7 February, Antigua's High Court denied the extradition appeal of former director of the Financial Services Regulatory Commission, Leroy King. Unfortunately. the country's Prime Minister, Baldwin Spencer, has not signed the order. Frankly, he has run out of excuses; Stanford was convicted this week after a jury trial. It is rumoured that King will name high-ranking present and former governmental officials, who allegedly took money and favours from Stanford. King, who faces a multiplicity of federal charges, including Money Laundering, Wire Fraud and Securities Fraud, needs to face justice for his offences. Considering that victims of Stanford's Ponzi scheme have threatened to initiate a boycott of Antigua, that tourist-oriented island nation should move, forthwith, to extradite its obviously corrupt former civil servant; The US asked for him in 2009. I have been to Antigua since the fall of Sir Allen, whose knighthood has now been revoked by Antigua, and it can ill afford to be blacklisted by any group who could potentially wreck its economy. Mr. Prime Minister, kindly discharge your duty, and turn Mr. King over to face justice for his corrupt behaviour. I recommend the recent article, Stresss, Compliance and Ethics, by the Society of Corporate Compliance and the Health Care Compliance Association. If you are a compliance officer or MLRO, please take the time to review it, as your health issues may be rooted in your profession. The verdict is in; guilty on 13of 14 counts,meaning a potential life sentence. Will he get it ? Since the Sentencing Reform Act of 1987, there is no gain time for a life sentence. The last time I returned to the United States from Dubai, they were waiting for me at Customs; apparently my profile had preceded me. Of course, once the agents learnt that I had returned from giving a lecture instructing bankers on how to identify money launderers, I was passed through without a search. This week, lost in the shuffle amidst a huge criminal indictment of American defense contractors working in Iraq and Jordan, was the story of an employee of the company who had been arrested on arrival in America when customs officers found $150,000 secreted inside his possessions. That's the good news; the bad news is that this was not his first bulk cash smuggling operation; he had previously brought in a total of $800,000, according to the reports. American contractors abroad, employees at private military companies providing security overseas, and assorted expatriates returning to CONUS* are all potential bulk cash smugglers. Why ? Payments for services rendered in cash, tempting illicit business "opportunities," and their extended presence in developing, corrupt, countries, where bribes & kickbacks paid out or accepted are the rule, all operate to raise the risk levels on these individuals. So, why on earth wasn't this contractor targeted by US law enforcement after the first couple of trips ? We cannot say, but should not such returnees be preselected, much as I have been, due to a high level of risk for smuggling of cash, financial instruments, or other items of high value ? * Abbreviation for the Continental United States, which excludes Hawaii & Alaska. The jurors deliberating in the Federal criminal trial of the accused billion dollar Ponzi schemer, R. Allen Stanford, have advised the court that they have been, thus far, unable to reach a verdict. The judge ordered them back into further deliberations. If a mistrial is declared, a costly retrial will be required. We continue to closely monitor this case, and will report back to you on all future developments. The failure by a Portuguese Court, to extradite the convicted murderer and airline hijacker, George Wright, to the United States, after the United States had exhausted every appeal in the Portuguese court system, us extremely disturbing. Wright, who escaped from an American prison whilst serving a 15-to-30 year sentence for murder and armed robbery, hijacked a Delta Airlines passenger jet to the Middle East, collecting a million dollar ransom payment en route. He was living in Portugal under an assumed name. When courts in a country where you, or clients, do business, fail to follow the rule of law, and make purely political decisions in major court cases, compliance officers at international banks must take note, and adjust country risk accordingly. Should your bank, or its clients, have any financial exposure in that country, whether through investments, trade, or financial instruments, risk that you will not be able to seek justice through that court system increases substantially. The Mujahadin-e Khalq [MEK], known in English as the Peoples' Mujahedin Organisation of Iran, has filed a Petition for a Writ of Mandamus,* asking the Circuit Court of Appeals for the District of Columbia** to direct the Secretary of State to remove its designation as a Foreign Terrorist Organisation [FTO]. In 2010, the D.C. Circuit held that the Secretary had violated the Due Process rights of the MEK, in denying its application for revocation of its FTO designation, and remanded the matter, so that the Secretary could remedy the constitutional defects, but no action was taken by the Department of State. This matter has attracted a great deal of attention, because both the United Kingdom and the European Union have delisted the MEK from terrorist status. The MEK, which opposes the current regime in Iran, disarmed in 2003, and claims that it has renounced terrorism. Its supporters and lobbyists in the United States have been pushing for deletion of its FTO status. * A judicial remedy in the form of an order issued to compel a government official to perform a ministerial duty correctly. ** In Re the Petition of Peoples' Mujahedin Organization of Iran, Case No. : 12-1118 (DC Cir). Joel Steinger, awaiting trial in US District Court in Florida for the Mutual Benefits billion dollar life settlement* Ponzi scheme, has been charged in a new case**, involving an alleged $3m health care fraud. Steinger, along with his brother Steven Steiner, and Steiner's partner, Henry Fecker, reportedly set up two shell companies, through which they fraudulently obtained insurance coverage. The defendants are charged with fraudulently claiming that they were full-time employees of dummy companies, and receiving payment or reimbursement of medicals through group insurance coverage. Allegedly, they committed these crimes whilst out on bond in the Mutual Benefits case. (1) Conspiracy to Commit Wire Fraud and Mail Fraud. A forfeiture provision appears in the indictment. Each of these counts carries a maximum penalty of twenty years in Federal Prison. Joel Steinger, who faces a potential life sentence in the Mutual Benefits case, was denied bond, after the Federal prosecutor stated that he posed a danger to the community, and was a flight risk. * Known in the United Kingdom as traded life policies, these investments have come under scrutiny as the result of the Mutual Benefits case.